In the prologue, our narrator Deadeye Dinghy sets the scene with a tale of a mysterious pirate, Captain Swaggersword, who disappeared many years ago leaving his chest of treasure hidden in a far and distant land. The action immediately switches to the Squirty Squid dockside tavern in Old London Town, where the ensemble sing 'Pot Of Gold'. We soon meet the Periwinkle family - feisty landlady Pearl, her fun-loving twins Jack and Liza and their rat-catching cat, Fiddlesticks. It becomes clear that Pearl dislikes all things nautical, ever since her husband Stanley was lost at sea. Deadeye also enters the scene as the children's pirate uncle, whom Pearl disapproves of and quickly ushers out before he can cause any trouble. However, the meddling Deadeye leaves a treasure map on the table, telling the audience "Causing trouble? Why, I've only just started!" Redbeard and his bumbling pirate crew of the ship "The Curry Bean" (named after their love of curry and beans) enter the tavern and overhear the Periwinkles talking about the map. After they leave, the family lock the map in the safe and Pearl tells the children of an island their father used to speak of (Lumbago, in the sea of Sciatica) as she sings 'Lumbago Lullaby'. As Pearl settles to sleep in the tavern, the pirates return in a comical midnight raid. Amazingly they succeed in blowing the safe, stealing the map and accidentally kidnapping a very cross Pearl. 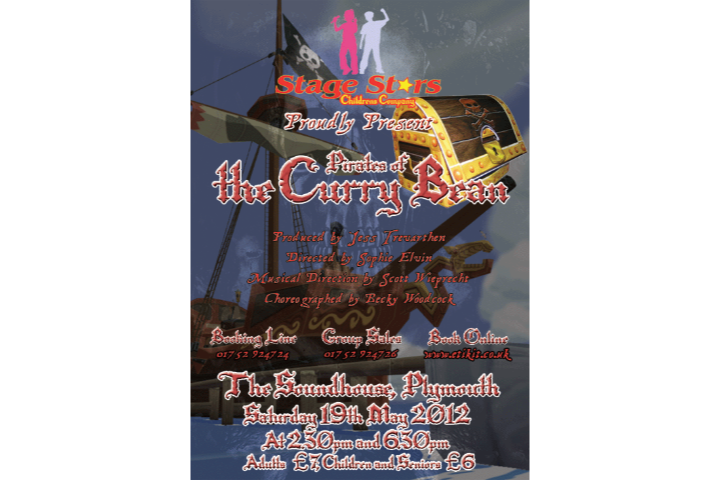 Aboard the Curry Bean, Redbeard is quite taken with Pearl and invites her to join his pirate crew, to which she agrees in exchange for safe return to her children in London. She and her children, though far apart, sing of their longing to see each other again in 'Underneath The Same Starry Sky'. Back onboard 'The Crunchy Frog', Hornhonker is sea sick, Cod is plagued by rats and Scuttle and Slack are causing mayhem. Cod licks his crew into shape and a fun mop dance follows. The next scene has the captains of both ships spotting each other through telescopes. After a comical sending and receiving of messages, the two ships meet and a dramatic slow motion battle follows. The pirates take over the Crunchy Frog, imprisoning Cod, Hornhonker and the reunited Periwinkle family. Redbeard invites everyone to join the pirate life and they sing 'Piratical Style'. Down in the hold, the prisoners are rescued by a well-meaning Scuttle and Slack, but in the attempt they accidentally pull out the plug from the bottom of the boat. With water pouring in, a sudden storm seals their fate as the ship is wrecked. All wash ashore on the island of Lumbago, where each group in turn finds the treasure map but is chased by monkeys before they can search for the hidden loot. Finally, Scuttle and Slack dig up the chest before being chased by an enormous gorilla. The different groups eventually meet and are welcomed by the natives with the song 'Lumbago'. Chief Wonga appears and sentences the trespassers to death, but when Pearl attacks him with a wet fish he is brought to his senses. Wonga reveals that he is Pearl's missing husband, and the children learn that their father was once the legendary pirate Swaggersword. Scuttle and Slack enter with the chest and Jack and Liza help to unlock it. Redbeard attempts to steal the treasure but his crew turn against him, making the Periwinkles their new leaders. The new pirates agree to return Cod and crew back to England, and Redbeard is suitably punished in an unusual way. A reprise of 'Piratical Style' provides a joyful ending to the show.